Are military weapons being used in the largest school district in North Carolina? That’s what Tayvon Bridges claimed at a Wake County School Board meeting. Last month we posted a video clip and transcript of one of several young radical activists that spoke out at a Wake County School Board meeting in North Carolina. In that clip, Qasima Wideman of the Youth Organizing Institute (YOI) made some shocking and unverified claims about police, both in schools and in Charlotte during the riots that occurred following the shooting of Keith Scott. Wideman wasn’t the only member of YOI making such claims. The first to speak at the school board meeting was another YOI member, Tayvon Bridges. The video and transcript of his remarks at the end of this article. Tavon Bridges is a 2014 graduate of Knightdale High School. In high school Tavon was a leader in the successful campaigns to stop the placement of armed officers in every elementary school and to get the school board to sign a new MOU with law enforcement. Tavon began working with the Youth Organizing Institute and is an alumni of the 2014 Summer Freedom School. 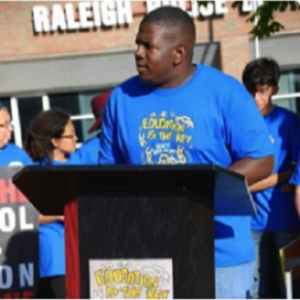 Tavon is currently an Ignite NC fellow, working with YOI on School-To-Prison-Pipeline issues and the criminalization of Black and Brown youth. Bridges assessment of the program as one that gives military weapons to local police is mostly accurate, if not very simplified. A far more detailed look at the 1033 program can be found in a research brief presented to Congress in 2014 titled, The “1033 Program,” Department of Defense Support to Law Enforcement. His claim about an “MOU” or Memorandum Of Understanding, however, is not as accurate. There is an MOU but it is not between Wake County law enforcement and the school district. The MOU is between the Department of Defense and any given law enforcement agency taking part in the program. In fact, the Governor of the state has to be involved, by appointing a State Coordinator. In other words, the State Coordinator position keeps tabs on any equipment or military weapons that are received in North Carolina via the 1033 program. A look at a list of 1033 materials obtained by North Carolina reveals that the Wake County Sheriff’s office has received a variety of equipment, however many of those items were received nearly a decade ago; some equipment goes back to 1993. The most recent equipment received was in 2013. View the list. Wake County Sheriff Donnie Harrison responded to request for comment on the program and indicated the equipment was no longer in use and most of it had been returned. “The equipment Wake county received under the 1033 program in the past is no longer here,” said Sheriff Harrison. Good afternoon. My name is Tayvon Bridges and I’m with the Youth Organizing Institute. Um, in support of the Week of Action Campaign. This is the seventh annual week of action campaign, uh, different events are happening all throughout the country around issues of police violence. Umm, uh… racism in schools, different issues of ticketing in schools, different infractions – so this so not – the issues I am speaking about are not Wake county’s issues but still issues nonetheless. Throughout me working with YOI and doing work with Week of Action we always discover and find out different ways that our schools have been militarized and how our students are being treated in our schools. I don’t know if any of ya’ll are familiar with the 1033 program? Which is basically a program that gives military weapons to the police districts and also I know that Wake County has an MOU with the police that station them in our schools. For black and brown parents, we see this as an act to militarize our schools and to further police and .. um… on extreme levels. Um, for those that don’t know the different weapons, I’m just going to list a couple. Um… grenade launchers, uhh, assault rifles…different things of that caliber. Things that we don’t think that would be necessary in any instance with uh… um… students. Different – uh… for us, like I said we feel like this is… like this is another tactic for us to be, err for our schools to be militarized. Um, we already know that we have police officers in our schools and we already know that with around the different issues of police violence and police killings. Uh… Keith Scott. We have Sandra Blunt. We have different instances where black bodies fall at the hands of police officers and yet they are still in our schools. As somebody that’s lived in North Carolina 20 years and continue to live ”¦ continuing to live in North Carolina and have been through all three branches – elementary school, middle school, high school and graduated in 2014… Um. As someone who in the future wants to have children, I want a safe environment for my child to be educated and not somewhere it’s militarized with the same people who are killing our people in the streets are the same people that are policing them and supposed to be keeping them safe in our schools. So and another thing about hashtags. Hashtags are used to make trends on social media and for people to be aware about the issues of different things that are happening throughout our communities. So uh, hopefully with working, uh, diligently with ya’ll as uh, uh a board and the community, we can make hashtag “Black Lives Matter” a trend in Wake County Schools. Thank you. This article first appeared at American Lens News on November 29, 2016. This entry was posted in #SJW, Am Lens, BlackLivesMatter, EDUCATION, Social Justice and tagged Tayvon Bridges, Wake County Public Schools, Youth Organizing Institute. Bookmark the permalink.